Located in Fort Worth, Hampton Inn Fort Worth Southwest Cityview is in the entertainment district, a 4-minute drive from Hulen Mall and 7 minutes from The Shops at Clearfork. This hotel is 4.7 mi (7.5 km) from Texas Christian University and 6.5 mi (10.4 km) from Fort Worth Botanic Garden. Make yourself at home in one of the 163 air-conditioned rooms featuring refrigerators and microwaves. Wired and wireless Internet access is complimentary, and flat-screen televisions with cable programming provide entertainment. Private bathrooms with shower/tub combinations feature complimentary toiletries and hair dryers. Conveniences include desks and complimentary weekday newspapers, as well as phones with free local calls. Enjoy a satisfying meal at The Bistro serving guests of Courtyard Fort Worth Historic Stockyards. Quench your thirst with your favorite drink at the bar/lounge. Cooked-to-order breakfasts are served on weekdays from 6:30 AM to 9:30 AM and on weekends from 7 AM to 10 AM for a fee. Located in Fort Worth (Downtown Fort Worth), TownePlace Suites by Marriott Fort Worth Downtown is within a 15-minute walk of Sundance Square and Bass Performance Hall. 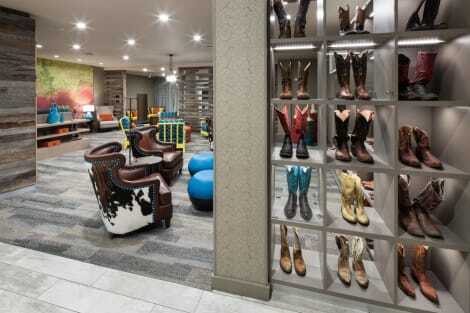 This hotel is 1 mi (1.7 km) from Fort Worth Convention Center and 3.6 mi (5.7 km) from Billy Bob's Texas. Omni Fort Worth Hotel is centrally located in Fort Worth, a 2-minute walk from Fort Worth Water Gardens and 10 minutes by foot from Bass Performance Hall. This 4.5-star hotel is 0.1 mi (0.2 km) from Fort Worth Convention Center and 0.6 mi (1 km) from Sundance Square. Enjoy a meal at Great American Grill, or stay in and take advantage of the hotel's room service (during limited hours). Quench your thirst with your favorite drink at the poolside bar. Full breakfasts are available daily from 6 AM to 10 AM for a fee. lastminute.com has a fantastic range of hotels in Fort Worth, with everything from cheap hotels to luxurious five star accommodation available. We like to live up to our last minute name so remember you can book any one of our excellent Fort Worth hotels up until midnight and stay the same night.